Effective monitoring programs, which involve systematic collection data on elephant population dynamics, poaching, and the trade in elephant products, are needed to provide a rational basis for the conservation management of elephant populations. Unfortunately, little is known about the status of Asian elephant populations and the little data that there is, is insufficient to estimate elephant population sizes in Indochina. The paucity of data is partly due to existing guidelines and survey manuals aimed at elephant biologists being out-of-date and incomplete. Many elephant surveyors are still using old and inappropriate methods or have adopted their own ad hoc methods. Consequently there is pressing need for an up-to-date and comprehensive manual covering the design and implementation of rigorous elephant surveys and monitoring programs, the assessment of human-elephant conflict, and the recording of parameters relevant to elephant conservation initiatives. In 2003, IEF contributed a workshop to bring together the leading quantitative ecologists, bio-statisticians, and elephant ecologists. 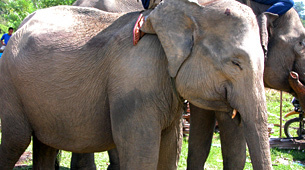 The participants at the workshop discussed how best to apply the latest developments in wildlife survey techniques and bio-statistics to elephant populations to be incorporated in a manual, funded in-part by IEF in 2004, to be distributed to appropriate government departments, NGOs, Universities, and other relevant institutions.